Rocky Vista University (RVU) hosted its 8th Annual Military Appreciation Ceremony on October 4th. The ceremony honored and celebrated the military servicepeople in the RVU community, including future military physicians and honored guests. The evening began with the Posting of Colors, a traditional flag ceremony conducted by RVU Color Guard members Bryan Eldreth (OMS-II, Navy), Karen Norling (OMS-II, Navy), and Sarah Szybist (OMS-II, Army). After the guests were seated, Clinton E. Adams, DO, FACHE, President and CEO of RVU and retired Rear admiral, welcomed guests and introduced the school and its accomplishments. Thomas N. Told, DO, FACOFP dist., Dean of RVUCOM and veteran, spoke of the enormous impact military medicine and physicians have had on healthcare delivery services and honored those who care for our troops. The RVU Color Guard then carried out the Missing Man/POW Remembrance Ceremony, a powerful and moving tradition that honors and recognizes the service of those missing in action, taken prisoner, or deceased. Narrated by Anthony LaPorta, MD, FACS, Professor of Clinical Surgery and Course Director of the Military Track at RVU, the student doctors approached a candlelit table which had been set with four place settings, each representing a branch of the military: Marines, Army, Air Force, and Navy. As the Color Guard placed their hats upon the empty plates, guests learned of the significance of the items on the table, such as the white tablecloth symbolizing the purity of a soldier’s purpose and intentions and the single rose set as a reminder of the soldier’s sacrifice and the love of their family and loved ones. To honor them, guests raised their glasses for a toast. Keynote speaker Kit Lavell, Executive Vice President of Strategic Operations, Inc. (STOPS) and former Naval Aviator, gave a history of the founding of the company and how it has grown to be one of the greatest Hyper-Realistic™ training support organizations in the country. Training at the STOPS facility incorporates battlefield special effects, ship simulators, and a simulated Emergency Room and two simulated Operation Rooms. “[The scenarios] are so realistic,” said Mr. Lavell, “that you willingly suspend your disbelief”. For 16 years, STOPS has provided training for not only RVU military students through the use of the Cut Suit®, but also for over 800,000 servicepeople. 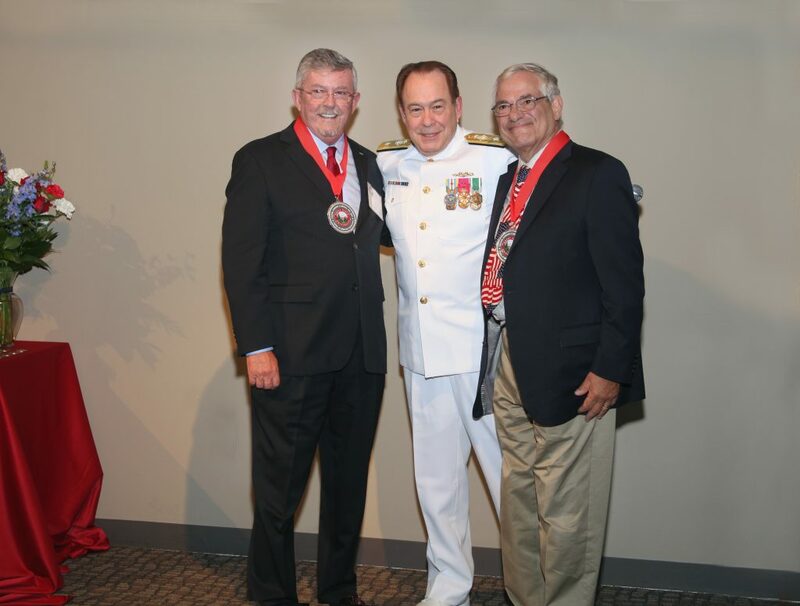 Dr. LaPorta was presented with the Order of Military Excellence by Dr. Adams for his commitment to RVU’s military students and innovation in healthcare education. The ceremony concluded with a beautiful rendition of “Amazing Grace” by Garrett Smith, OMS-II. A cocktail reception followed with a musical performance by South Metro Fire Pipes and Drums. To see photos from the event, visit RVU’s Facebook page at https://bit.ly/2pHWiOI. You can see video footage from the event at https://bit.ly/2EsvFYi.